With Kashmora ready for a Diwali release, the otherwise shyA� Karthi gets candid about the industrya��s six-pack obsession and hisA� stint at the Nadigar Sangam. Touted to be a a�?multigenrea�� film, Kashmora follows the stories of three charactersa��a man who practices black magic, a 500-year old warlord, Raj Nayak, who enjoys violence and bloodshed, and a third, whose look and character remain a secret (all played by Karthi). a�?When director Gokul narrated the script to me, we needed to figure out how to bring out Raj Nayak, with just 30 minutes of screen time,a�? says the city-based actor.A�Having tonsured his head and grown an unruly beard for the part, he promises it will be a completely new look. a�?We had to make sure that the characters looked nothing like me, so Gokul came up with close to 45 sketches, keeping with the bald-with-beard brief, paying so much attention to detail, right from the eagle tattoo on my face to my armoury,a�? he adds. 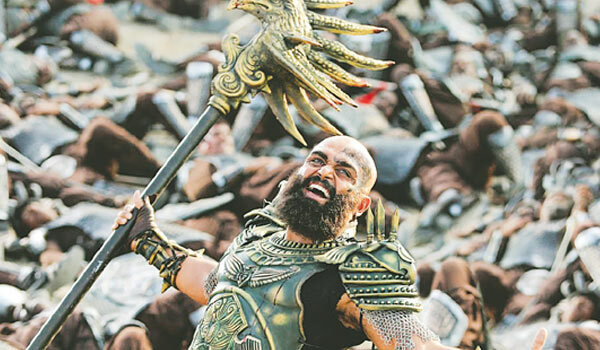 Despite nursing a severe neck injury during the final stages of the shoot, Karthi stayed in character as the ruthlessA�warrior. Shooting from morning till evening (at location in Thiruvotriyur)a��with mandatory gym training and four-hour-long makeup sessionsa��Karthi says, a�?I am not particular about looking different in every film. Certain movies of mine need me to make changes and thata��s when I do it. The characters I usually play dona��t need me to focus on that fad.a�? With his last gamble with experimentation, Selvaraghavana��s Aayirathil Oruvan (2010), bombing at the box office, is he unsure of Kashmoraa��s fate? a�?Ita��s either a success or it isna��t, and we have all come far enough to take either in our stride. What works for the film is ita��s a packagea��there is humour, horror, action, drama and, of course the period element,a�? he says. The film, incidentally, marks his first association with actress Nayanthara. Karthia��s stint in Tamil cinema started when he came home from New York, fresh out of an engineering postgraduation, to join Mani RatnamA�behind the camera.A�But the ace director saw the actor in him, and offered Karthi the lead role inA�Ayitha EzhuthuA�(2004), which later went to Siddharth. But three years later, he took the big step withA�ParuthiveeranA�coming his way.A�Now, 12 years since, the student is back with his mentor, playing the lead in his upcoming romantic drama, opposite actress Aditi Rao Hydari. Talking about his equation with the legend, the fanboy in Karthi says, a�?Back then, I was too much in awe of him to have a proper conversation. Today we discuss cinema and I give him my inputs for a scene. When he considers or uses something, ita��s a great feeling,a�? he gushes. Despite belonging to a family with an enviable cinematic legacy, the Alex Pandian actor attributes his work ethic and discipline to the stalwart. a�?It feels like coming back to school. Everything is so stress-free because we know hea��s at the helm,a�? he quips.A�While he agrees that being an actor allows you to observe and learn so much more without getting behind the camera, he also points out that restraint is needed when contributing his inputs and opinions to the team.A�a�?As an actor, almost 85 per cent of the film rides on your shoulders, so you should be involved. But the film is ultimately the directora��s brainchild and he/she will know best,a�? he says.A�The actor further adds that one is fortunate if the director moulds the story according to the performance. a�?It is a boon and you see yourself getting better with each shot in such an environment,a�? he says. When youa��re the youngest in a family that has big names like Sivakumar, Suriya and Jyothika, comparisons are inevitable. When asked how similar he is to Suriya, Karthi chuckles. a�?We do different roles and characters. His choices are starkly different to mine, so there has never been a need to analyse,a�? he shares. The actor sheepishly adds that he isna��t too fond of seeing himself on screen once a project is done and says his family and friends do the analysis for him. a�?We have these round-table dinner conversations everyday, where everything from movies to family gossip is discussed. Thankfully, scripts and criticism arena��t served there. My brother and sister Brindha handle that,a�? he adds.A�The actor is characteristically modest about the mass following he enjoys, despite not being a textbook hero.A�a�?Apart from your upbringing, everything else is uncertain. People liking you is a big blessinga��that makes or breaks you,a�? he quotes Superstar Rajnikanth. Off camera, Karthi has also been very involved with the Nadigar Sangam. The actorsa�� association, which has been making headlines for a few years nowa��about a lease agreement with SPI Cinemas and plans to build a multiplex on site (of which only one floor would be given to the Sangam)a��roused him enough to team up with four other actors and contest in an election to take up positions of power within the association. a�?We werena��t willing to let go of that property. An actora��s association is one where people come together and if the centre of it all, the Sangam building, goes, then how does one identify with that heritage?a�? he asks, recallingA� the struggles during the election. Currently he balances work and his role as the Sangama��s treasurer, which takes up a big chunk of his time. Known for his proactive approach to social work (working extensively with children and the underprivileged), he insists that his first responsibility is towards the industry that gives him his bread and butter. a�?The position in the Sangam is an opportunity to give back to the community that has made me,a�? he adds. Known to be very focussed when it comes to his work, Karthi says he prefers not to sign on too many films at a time. But he is also always on the lookout for scripts that draw him in. a�?I like engaging stories. And I like to work with directors whose work I have personally enjoyed,a�? he says, naming the work by Vinod (of Sathuranga Vettai fame) and Vetrimaaran as among his favourites. With the shoot of Kaatru Veliyidai progressing quickly, he shares that he has also signed an untitled cop film with Vinod. Be it playing a village rogue, complete with the quintessential Madurai accent in Paruthiveeran, or crooning for Biriyani (2013), he is not one to shy away from picking up a new skill for a movie. Hea��s taken horse riding and sword fighting lessons for Kashmora. a�?We spent 15 days getting the horse, Blackie, comfortable with me. I loved horses as a kid. I hope the producers gift him to me,a�? says the actor, who has also taken flying lessons for his role as a fighter pilot in Mani Ratnama��s next. A huge nature buff and wildlife lover, Karthi loves travelling when he is not in front of the camera. When his shoot schedules permit, he catches up with friends and makes sure he spends time with his daughter, Umayaal. TheA�actor took a break at Bali with his family this August. Not much of a gadget freak, Karthi is, however, a self-confessed iPhone addict. a�?I have spent half my life with this thing and I need to get over it if I want to avoid brickbats from my wife,a�? he concedes.